Various folks had mentioned to me that I should check out Lyralen Kaye's St. John the Divine in Iowa, the latest from Another Country Productions - so I made it to one of the final performances last weekend (I promise to someday catch up, reviewing-wise, so I'll be writing about shows that are still on the boards!). And I understood why people had found the script appealing - Kaye has written (and given herself the starring role in, btw, at left) a gently probing comedy about the inevitable confrontations between current gay lifestyle and traditional religious and moral norms - even when (actually, especially when) the avatars of those norms are eager to embrace diversity, and shed the prejudices that have long defined their roles. 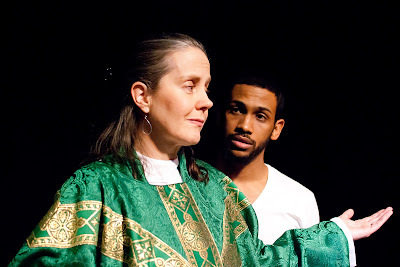 To be specific, playwright Kaye has conjured one Reverend Alex, a liberal Episcopal minister out in the sticks of Iowa, who is eager to guide her flock toward the open embrace of gay marriage (currently, of course, only one facet of an ongoing rift that threatens to split the Episcopal communion apart, and which is also still a political flash point in Iowa). Sweetly contented with her own open-mindedness, Reverend Alex suddenly finds this issue playing out quite close to home when her daughter Sarah (Caitlin Berger) arrives on the doorstep with a pierced, punkette girlfriend (Meghan Rice) in tow, confident that Mom will prove her spiritual and political mettle by marrying them right then and there. The audience is quite a bit less surprised by this "shock" than Revered Alex is - but rest assured, Kaye does have a few tricks up her dramaturgical sleeve. The intriguing thing about her script, in fact, is the way it calmly turns the tables on audience expectations. For it turns out that Sarah's beloved - also, perhaps significantly, named Alex - wants a marriage, but doesn't want monogamy; she instead has a vision of connubial bliss in which Sarah will always "come first" for her, but only as first among many. This is, of course, only an accurate reflection of how many gay people expect their marriages to work - but can Reverend Alex honestly consecrate such a union within her faith? Stated more generally - can homosexuals (like, say, oh, Andrew Sullivan) with no intention of maintaining monogamy, honestly ask to be married within a Christian - or Jewish, or Muslim - framework? But then I'm not sure we've yet seen a real satire of millennial gay manners, have we - by which I do not mean some campy, tongue-in-cheek travesty, but rather an honestly pointed satire. Which led me to ponder how politically pandering the contemporary theatre, which is far too often paralyzed around modes of victimization, has really become. Pleas for tolerance such as To Kill a Mockingbird, or Boston Children's Theatre's recent Reflections of a Rock Lobster, should always be on the boards, of course, but among us grown-ups, must the same style remain the be-all and end-all of the art form? Watching Kaye's drama, I wondered whether it would even be politically possible for a playwright today to shake down the various illusions surrounding gay marriage without bringing down a chorus of disapproval (the pretensions of straight marriage are regularly fisked on stage, but gay marriage is generally given a complete pass). The interesting thing about St. John the Divine in Iowa, however, is that it started out as a screenplay - which perhaps explains how Kaye dared to raise these issues at all. Indeed, with that knowledge in mind, I often found myself missing the edge the material might well have had if it had actually been produced for, say, cable TV rathe than the stage. Which is all very strange, isn't it? That television should often have more political edge than the theatre? Still, I suppose St. John the Divine in Iowa counts as some kind of start for our moribund little art form, even if the conversion from screen to stage yields some inevitably rough dramatic carpentry (the conflicts at Alex's church, which we imagine would require scenes of some scope, are inevitably given short shrift here, which leads to a sometimes episodic, bumpy structure). 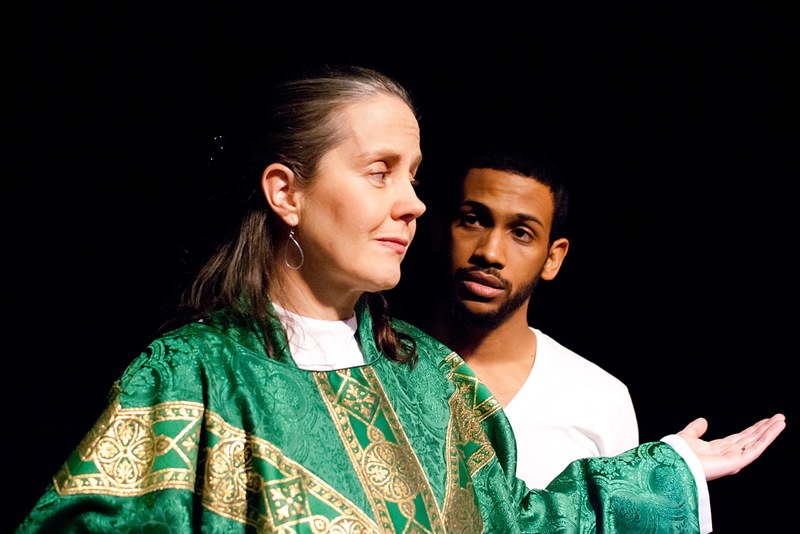 Still, director Julia Short draws subtle, committed work from Kaye and really her entire cast - even from Joan Mejia, the gentle dude who wanders through now and then as Jesus (an impossible role if ever there was one). I suppose if I were a bit more like Him, I'd see only the strengths, and forgive entirely the gaps, in St. John the Divine in Iowa. But then you know I'm never one to deny the devil his due.